Last weekend we had a sad morning saying goodbye to good friends. We were approaching our third year anniversary in Nashville and it seemed we were going backwards, not forwards. We were tired of the heat, the bugs, and the sameness of our experiences. The spontaneous partner in our marriage stood up and declared that we needed to get out of town. We had one more week before she started her new job and Evie started school, so it was now or never. We wanted to drive less than two or three hours (Kymberlee) and go somewhere we had never been before (Paul). After a brief flurry of ideas, we settled on Paducah, Kentucky. Why? Burgeoning art scene, river history, and plenty of natural beauty around such as Land Between the Lakes and Shawnee National Forest. The map geeks (Paul and Evie) thought that it would be really cool to see where the Cumberland, Tennessee, and Ohio rivers all meet. At one point, we thought of how the cousins in Huntsville could start floating down the Tennessee, we could start floating down the Cumberland in Nashville, and we would all end up in the same place. We started off Wednesday morning, stopping by the Woodlands Nature Station on the way. What did we see? Cool birds like owls, bald eagles, and turkeys! And ultra-rare Red Wolves. Decimated first by hunting and poisoning, they are now limited by the expansion of coyotes in the Eastern U.S. as they are only slightly larger than coyotes and not as adaptable. They were the first species to be captured from the wild in order to save them. This model has subsequently been used for the California Condor and the Black Footed Ferret. 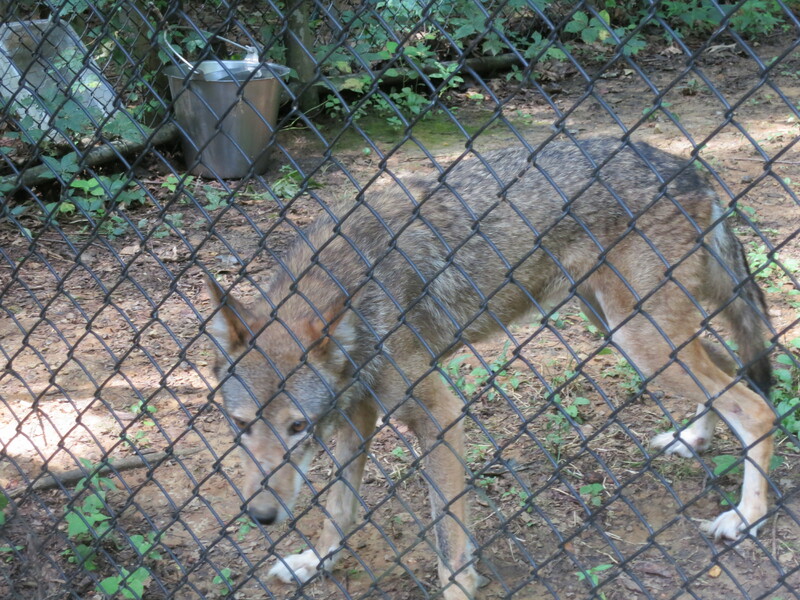 Read more about the reintroduction efforts here: http://www.endangeredwolfcenter.org/educational-resources/red-wolf/#. We all had a great time learning about the animals here, and, not to worry, all the animals are rescued animals and not fit for reintroduction. Evie especially enjoyed sitting through the wolf feeding and the snake talk, doing her best to answer every question that the presenter asked about snakes. We continued through Land Between the Lakes and eventually arrived in Paducah. We were staying in a room behind a gallery, and the gallery owners and hosts were absolutely delightful. They are retired teachers and have been in Paducah for ten years, initially moving here because of Paducah’s innovative Artist Relocation Program. 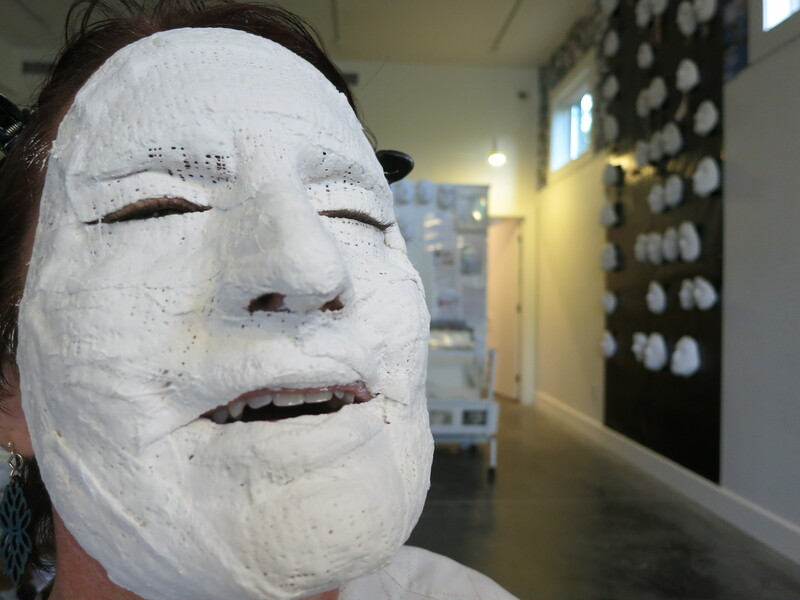 Char is in the middle of a large art project that consists of making life masks – face molds of friends, family, neighbors, and in our case, guests. 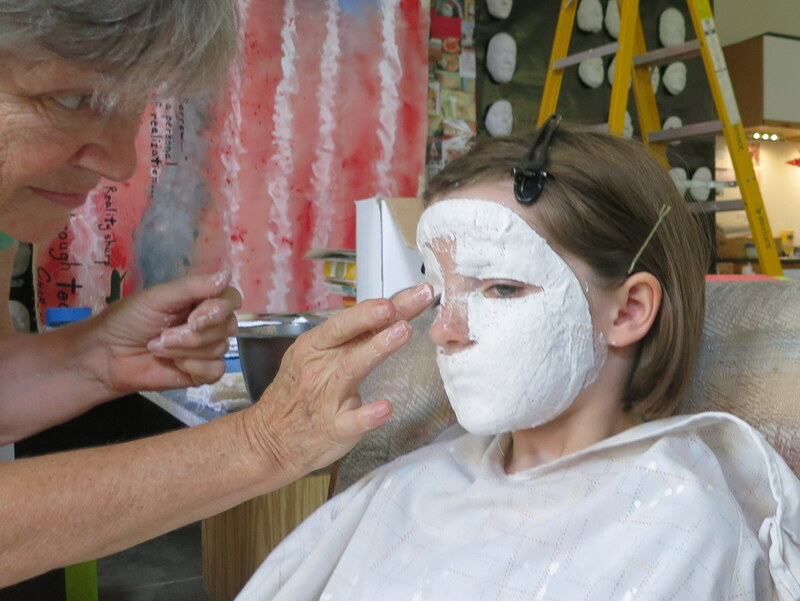 We are the adventurous sort and love art, so we quickly agreed to be “plastered.” Evie was first, though it was clear from her expression that she was not too sure about the process. Paul and Kymberlee decided to do it smiling, with mixed results. 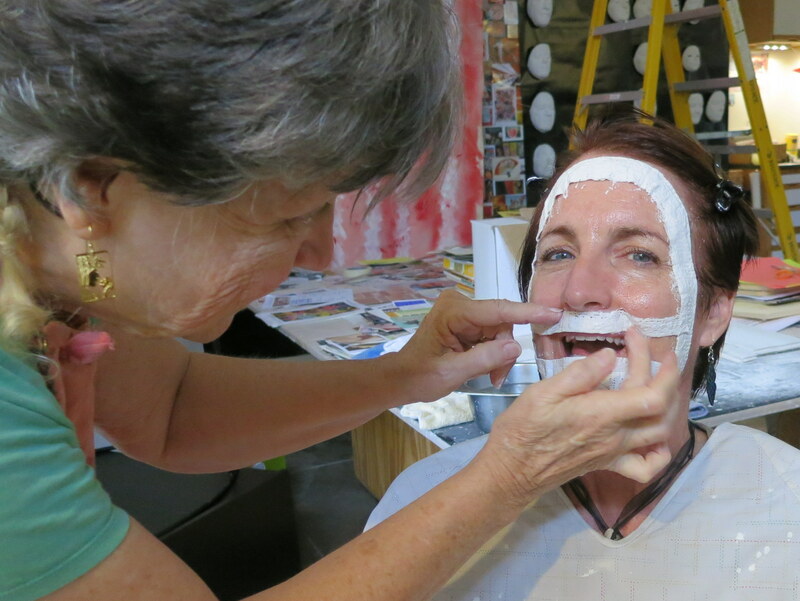 Removing the mask is the fun part. Ever feel like your face is being pulled off your head? Here’s a video of the process. 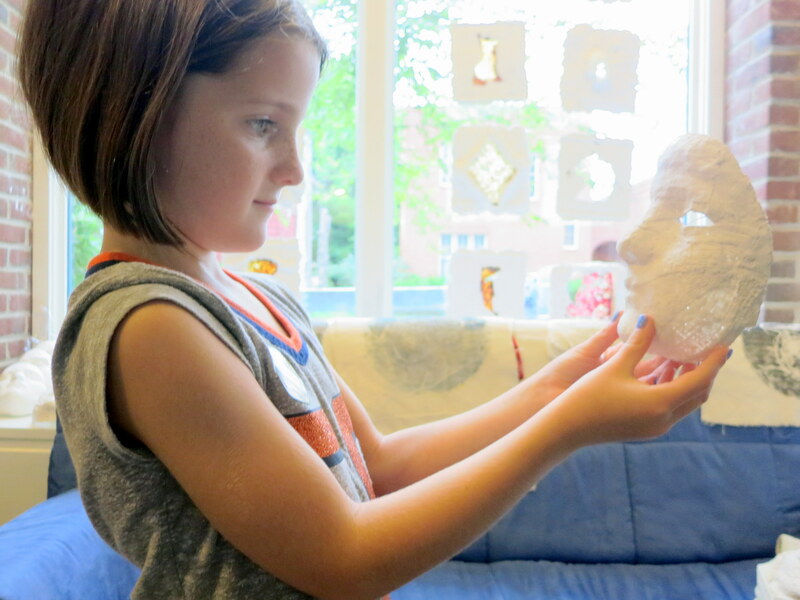 Evie was able to do another one to take home with her, and I love this shot of her doppelganger. So what else did Paducah have to offer us the first night? Another nice surprise, it turns out. 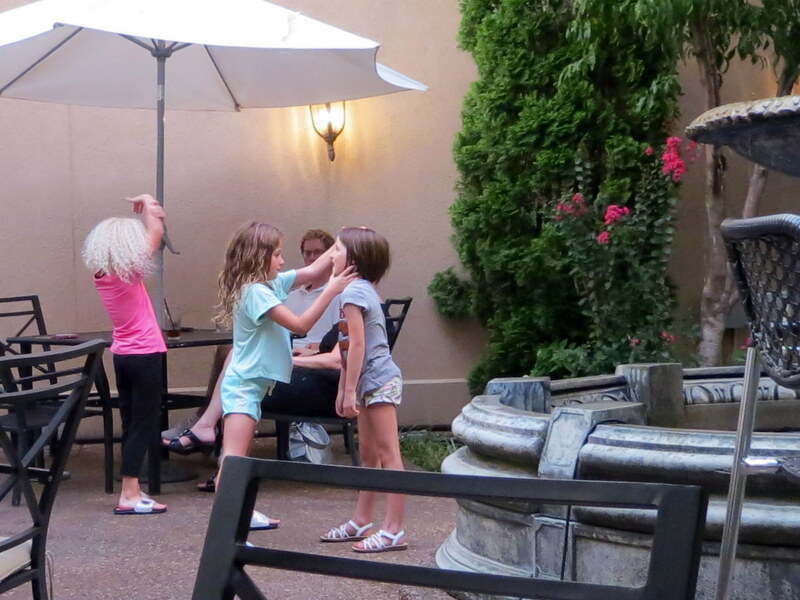 We headed down to the riverfront for dinner and ended up finding a nice patio with a fountain, live cheesy music, and two other young girls! 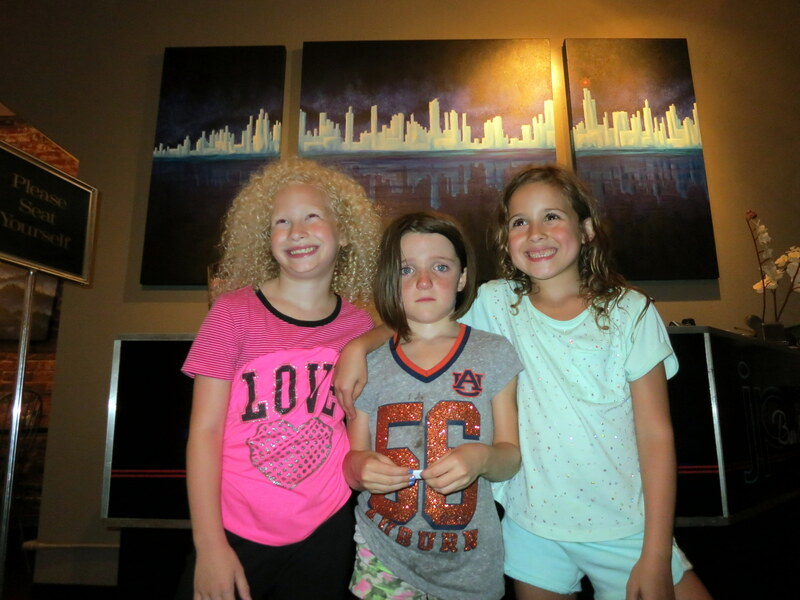 Plenty of pennies went in to the fountain that night, and Evie ended up with two new friends. The adults were able to have great conversation and the kids thoroughly enjoyed playing together for a solid two hours! As you can tell, she was not happy when it came time to leave. All of this made for a long, fun, and fulfilling day of adventure and discovery, so we all slept very well in our temporary home. Missed the video here, but did see Evie’s removal earlier!